A £17m regeneration project in Scunthorpe is moving closer to completion almost a decade after initial plans were unveiled. Hull-based construction firm Hobson & Porter is building five two and three bedroomed houses and 19 one and two bedroomed apartments on West Street and neighbouring Gurnell Street. Around 30 car parking spaces will also be created. Dave Blades, business development director at Hobson & Porter, said: “The need for affordable housing is growing and we are delighted to be working with The Guinness Partnership to deliver this project. “At Hobson & Porter we are always looking for projects to work on that will make a real difference to the local community in which they serve and I have no doubt this one will do just that. The original properties were beginning to create a bit of an eyesore in the town and we are looking forward to providing a fresh new look to the area. The development is being funded by The Guinness Partnership, which provides a range of services including care and support, neighbourhood investment, housing management and rental or ownership opportunities to more than 60,000 homes nationwide. 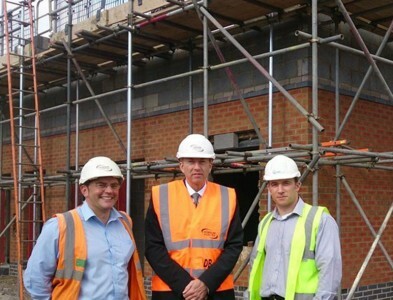 Works on the remaining Advance Crosby Regeneration Project site are set to be completed over the coming years.